The Virtual Reality aspect could come from the Oculus Rift. It'd be a subscription based game, and there would be no text chat, only voice chat. So it'd require a microphone for communication, and as in some games currently, your character's mouth would move when you talk in-game. There might be 2 servers, or 1. If there was 2 then I'd recommend a role-play server and a normal server. The game should also have pure open PvP, where you can kill other characters even when in towns, but if any guards could hear they'd investigate and if they saw then they'd attack the characters. They could also put out bounties on the people that killed them, so that bounty hunters can go out and kill them for rewards. There could be several bosses in dungeons... and this is where it becomes hard to keep it pure open-world: Other people can still loot from you and other people can assassinate you while you're fighting in a dungeon. I like that there's such an option, but it obviously has some problems with it. This could easily be fixed with dungeon instances but it'd lower the level of immersion with loading screens. That's enough of my idea so far, I'd enjoy reading your thoughts and opinions and also would like it if anyone could pick up this idea and develop it, but of course the brainstorming isn't over until everyone comes to the same conclusion. stuff like that wouldn't really be that popular. But you know what will be? 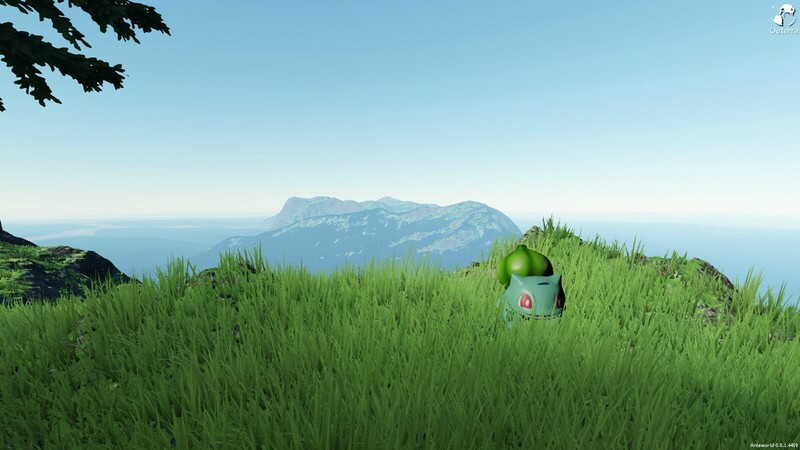 an open world pokemon MMO. Yeah, Pokemon MMO might be popular if it isn't terrible, but my idea will definitely be popular and if you can't see that then I honestly find that hilarious. but....I want a pokemon mmo. But I would probably not play it. I might pick it up for an hour or so and never touch it again. I remember being in a comic-book store surrounded by little Pokemon munchkins excitedly talking about Pickachu and whatnot, and eagerly trading stuff. Felt like I had wandered into an alternate universe filled with grade-schoolers (with shiny antennae coming out of their foreheads) speaking in an alien language. I was into pokemon growing up. My mother used to buy me the pokemon cards regularly. I stopped liking them when the new pokemon started to show up, 3rd gen I think. Oh come on, how did this thread get so off-topic? Make a new thread if you want to discuss pokemon. Of course this idea is heavily influenced by the popular series ".hack//", however I think there's a few things that can be improved, like for instance a completely open world, not just instances. This comparison is lost upon anyone who isn't familiar with .hack, myself included. The most I can glean out of a brief look at wikipedia's description is that .hack as a game series is about "a game within a game." There's too much to take in by comparing it to the entire series, even to those familiar with it - where the influence lies isn't currently defined. It certainly is an interesting concept, but how would this reborn concept advance your game concept asides from being a time-sink? With MMOs, the case has come to be that rule number one is to be as accessible as possible in regards to hardware. No text chat operates strongly against this and I don't particularly see anything that the game would gain from it, other than eliminating text-spam from bots. If there is anything that would warrant multiple servers it'd be PVP and non-PVP servers, unless PVP is the draw & lifeblood of the game. While it could certainly go an interesting direction with the features described, the description is currently too anemic to give a proper critique or commentary on, especially to someone not familiar with some or all of the mentioned inspirational games (and tech in the case of Oculus Rift.) As it is there is nothing to potentially draw a person into the concept except for the concept of reborn and the cutthroat, backstabbing element of always-PVP mode you've alluded to, neither of which are new and grand concepts in game development. Lives in a Jheuloh Bowl, under a Rock. Beware the Guard Lizard(s). Also you should take a look at the SAO (Sword Art Online) anime serie, it is also about a vrmmorg and has some good concepts. I don't like the controlling the character with your brain style form SAO tho you could replace that with some thing like this the gaming glove i think that would be really cool. And also i am happy i am not the only one who thinks about making this. ps. if you need any help on tackling a problem in this project (that is if you actually get around doing/starting it) just pm me any time!